Money doesn't grow on trees, but creative solutions do—at least for one clever blogger! Try this free DIY to supplement your storage and add a personal touch to any room. If you actually wear everything you own, you might be part of a growing trend: people paring down their possessions in hopes of simplifying their lives at home. When clutter starts to pile up, it can get in the way of focusing on what’s really important. Taken too far, however, decluttering can create a sterile look more reminiscent of a hospital ward than a home. 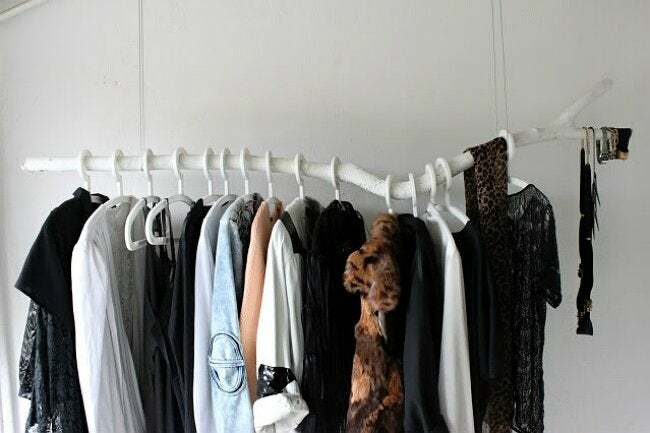 But DIY-er Ivania from Love Aesthetics found a compromise between minimalism and eclecticism when she repurposed (read: installed for practically free) a backyard branch as a one-of-a-kind clothing and accessory rack. Spray-painted white and suspended from the ceiling, this bit of nature offers storage as beautiful as the rest of your possessions, all without taking up any floor space. 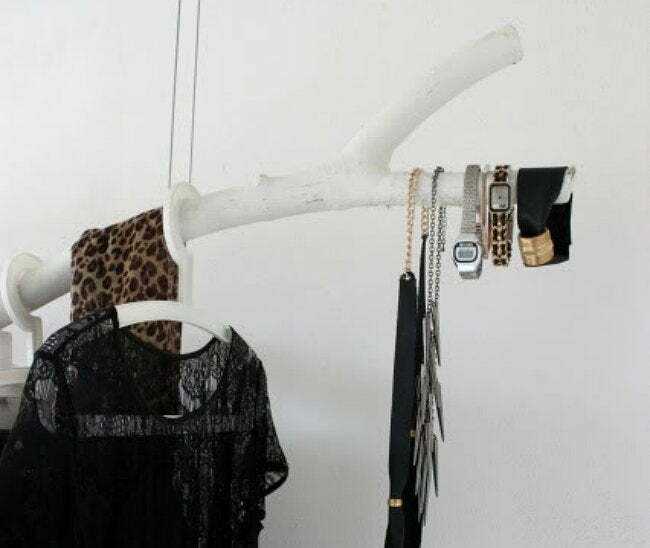 And it’s not just a cure for the closet-less: the length and shape of this DIY rack also make it a smart solution for hanging up a collection of scarves, watches, ties, belts, and other accessories. Storage that’s functional, free, and personality-packed—now that’s an idea worth hanging on to! To make your own, search out a branch that’s not too long or too short for the space, ideally with at least one smaller limb ready to hold accessories. Paint or keep it au naturel, the choice is yours—but be sure to give it wash before hanging your clean clothes from it. Next, pencil the height the branch will hang at along the nearest wall. Measure the distance between there and the ceiling to determine an appropriate length for wire or rope, and get two pieces (plus a couple of strong hooks) from your local hardware store. Screw in the hooks to the ceiling, run a wire through each and around the branch, and double-knot at the end. If it hangs evenly, your job is done! Just hang your curated wardrobe and take joy in the green you’ve pocketed by doing it yourself rather than splurging on a $200 closet unit.